When it comes to sarees, I always prefer a lightweight or chiffon piece over something heavy and embellished. As much as I love the look of vintage silk sarees, I’ve never been able master getting the pleats just right on myself. I save those for days when my mom is on hand for the saree tying process. Lately though I’ve been thinking about how I always wear my sarees in the same way. 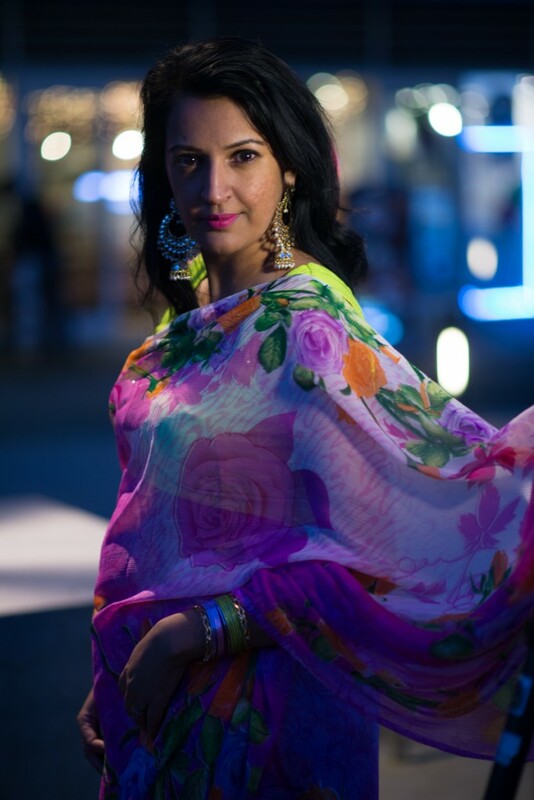 Once I’ve had a blouse sewn to go with a saree (or found a pre-made one that matches) they always go together. It’s not exactly cheap to get a blouse sewn where I live ($40-65), so I’m generally hesitant to get more than one made for one saree. Like I mentioned last week, we are moving, and in the process of packing I saw all my beautiful sarees and started feeling bad about how little use they get. That’s partly because I only wear them with the same blouse every time, and partly because I pretty much only wear them as formal or “party wear”. Well, I think it’s time to change that! Maybe it’s just my mindset, but I’ve never reached for a saree for a dinner party, business formal or an afternoon lunch … but that’s my challenge for myself this year. And as a bonus, I’m going to try to wear them in new unique ways. 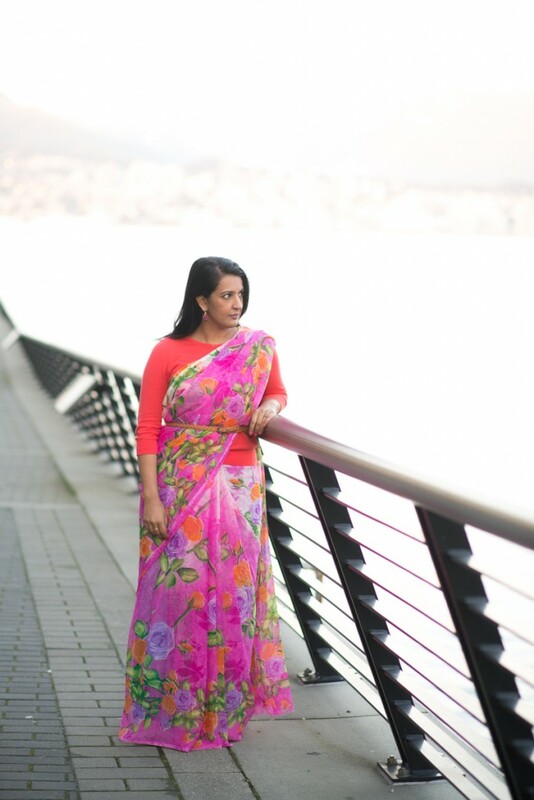 First up, my favourite pink floral saree worn with an orange cardigan and skinny belt…. 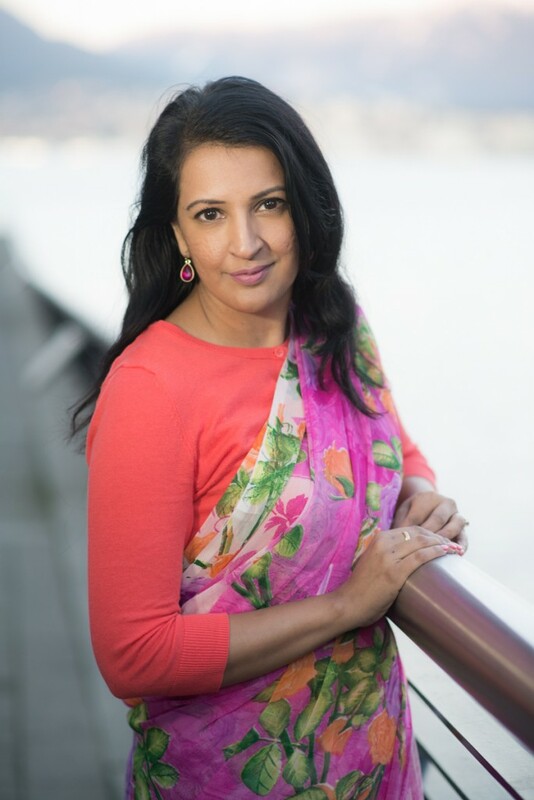 I normally wear this saree in the summer with a sleeveless green blouse and chandbali earrings, but I love the fresh look with the cardigan! 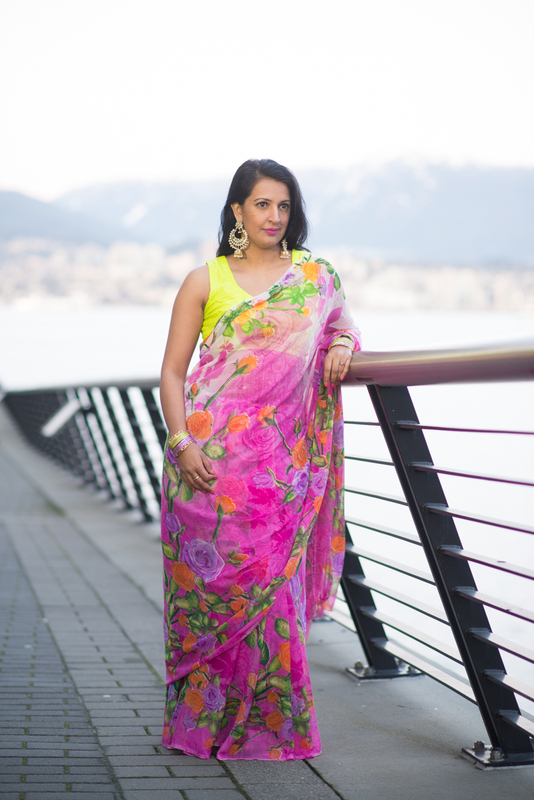 Love the sari and it’s awesome that you are going to try wearing them more often. I wish more of us ladies would start doing that. Love the two ways you came up with, especially the cardigan idea! 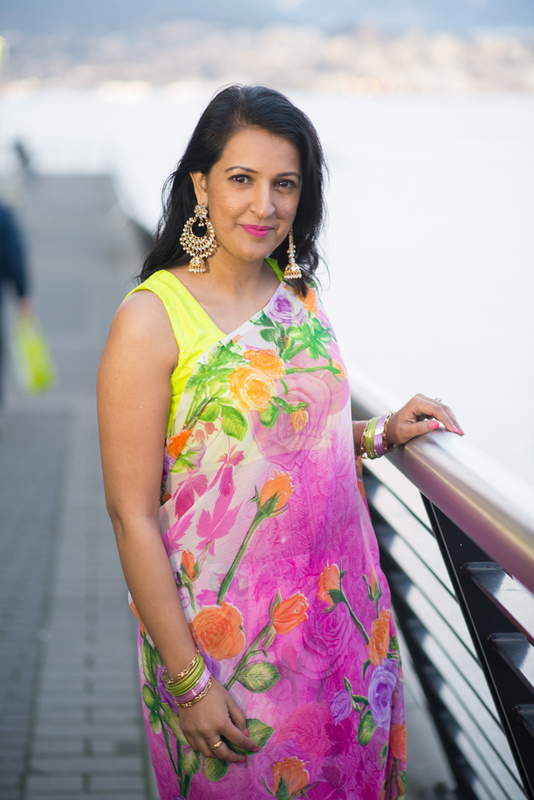 I liked wearing them with fun tanks instead of the actual sari blouse. 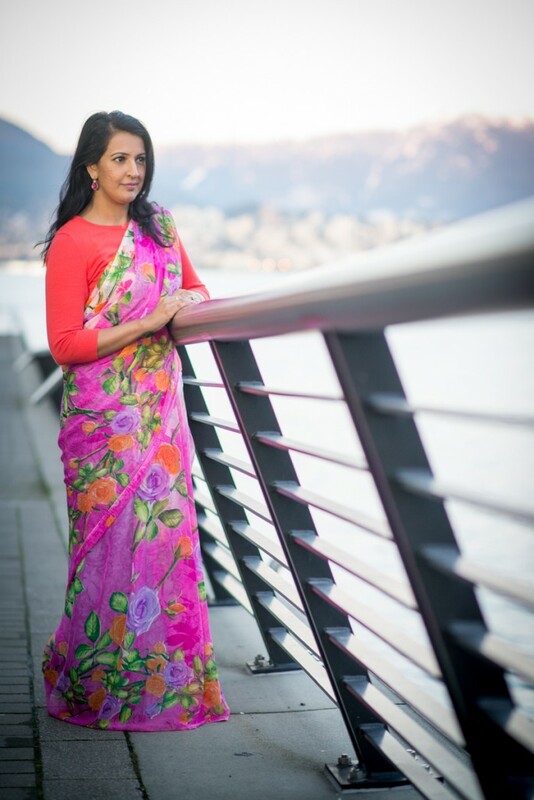 WOW…i love the floral saree. N u shud try wearing them more often. u look gorgeous. I don’t like Saree much because it’s very hard to wear but you gave me another way to wear it.